Later today, UM will announce the hiring of Warde Manuel as the 13th director of athletics at the University of Michigan. Manuel, a teammate of Jim Harbaugh's back in the 80's, has most recently (since 2012) served as the AD at the University of Connecticut. Before that, in 2005 he took his first AD job at Buffalo after serving as an associate AD at Michigan. Manuel will be the first AD Michigan has ever hired who has prior athletic directing experience at another school. However, every Michigan AD since 1921 has had at least some prior connection with the University. Manuel played for Bo Schembechler and with Jim Harbaugh back in the 80's. Manuel's playing days were cut short by a career-ending neck injury. Initial reports estimate Manuel will sign a 5-year deal worth $700,000 a year. It will be less than what Dave Brandon made in base salary ($900,000), but more than what current interim-AD Jim Hackett made. For Hackett, this hire marks the final piece of the puzzle he was hired to help put back together in the fall of 2014. Its tough to describe just exactly how impressive Jim Hackett has been throughout this entire process. As I sit here right now, I can not find one thing he didn't leave in better shape than how he found it. In just 15 months, Jim Hackett has lead one of the greatest resurrection projects in the history college athletics. The hiring of Jim Harbaugh would've been enough for any athletic director. But Hackett went well beyond that. With his well-mannered tone and ability to directly address the problem, Hackett repaired a horribly fractured relationship between the fans, mostly the students, and the athletic department. He didn't make any sweeping departmental changes, as he left a lot of that work to be done by his replacement, but he did act as a steward for the bulk department during this transition, and what can only be considered one of the lowest points the department has ever faced. Hackett won over fans, students and athletes with his ability to listen to the right people and make things happen. His no-nonsense approach was a welcome change from the Brandon era. He held a "fireside chat" to help heal the wounds with students and bring their voice into the conversation about decisions he needed to made. Decisions regarding the stadium atmosphere on gameday, whether to return to Nike, which he did...ending Michigan's tumultuous adidas era. Hackett's focus was clearly addressing football-related issues, but he also locked-in John Beilein with a new contract through the 2020-21 season. The one thing Hackett seemed to value above all else, was giving people what they wanted, rather than chasing the money and trying to force his own vision down people's throats, much like Brandon did. 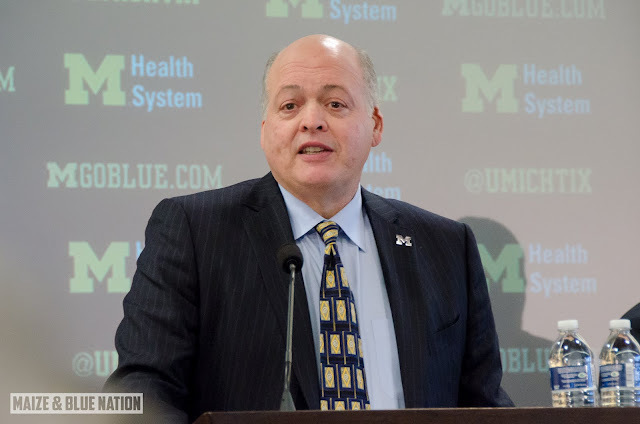 Despite being so good at it, Jim Hackett never wanted to be an athletic director. He knew from day one that this was a temporary appointment and in his final act would be to go out and find his replacement. From all reports, like every other decision he's made during his short tenure, he nailed it. From my perspective, the biggest challenge Warde Manuel will face will be his ability to continue the positive momentum that Hackett has built. No AD in my memory has come into Michigan with so much going in the right direction for him. Manuel will benefit from all of the positives Bill Martin and Dave Brandon brought to the department, without any of the negative baggage...thanks entirely to Hackett and how he single-handily repaired those fractures. Another challenge for Manuel, let's face it, will be how he can manage Jim Harbaugh. Being former teammates, its clear that Manuel knows what he's getting with his head football coach. He clearly knows what he's inheriting. 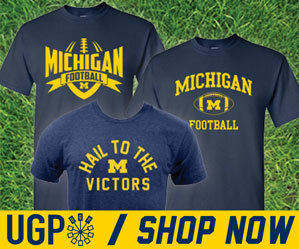 I can only imagine not every AD would be cut out to be Jim Harbaugh's boss. The ebb and flow of that relationship will be highly scrutinized for as long as these two remain at their Michigan posts. My final takeaway is this...with the Jim Hackett era coming to a close, it's astounding to me just how well the wounds of the Brandon era have healed. A lot of that was thanks to Jim Harbaugh, of course...there's no replacement for winning. But in a larger sense, everything that has happened over the course of the last 15 months has been rooted in genuine righteousness. What does that mean? It means that there wasn't some draconian agenda...decisions have been well thought-out, other ideas have been considered, and people have been listened to.